Whether you are looking for "Save the Date" magnets, calendar magnets, wedding magnets, or business card magnets, Bargain Printing will provide you with a personalized magnet that will be noticed. All magnets are done on a heavy 17 pt magnetic stock with protective UV coating. Magnets are a great way to keep your name, your logo, and your message front and center. Whether it’s on the fridge, the van, or the face of the file cabinets, getting the word out has never been easier. You could reproduce your business card and hand them out as promos. Want a message that sticks? Print magnets. Try calendar magnets for year-end corporate gifts, try business cards magnets when you send out invoices, or try colorful magnets to advertise your favorite charity or a very special event, just for fun. 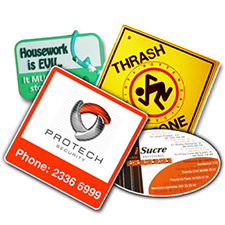 And you can transform your van or your car easily into your business by printing car magnets. When your customers take magnets home, your message will stay on the fridge. Your customers will be reminded to give you a call, take another look at your website, or recommend you to their friends. Magnets can put you at the center of their network. 2" x 3.5" 4" x 3" 4" x 6" 4.25" x 6" 4" x 7" 4" x 8" 4" x 11" 5" x 7" 8.5" x 5.5"